Without insulin, I would be dead. Plain and simple. More specifically, I would have died almost twenty years ago. This small, unassuming liquid is what keeps me alive. So clearly, insulin holds a special place in my heart. As do Banting, Best, and everyone else involved in its discovery. All it takes is seeing a number like this to remind me that my life depends on insulin. This? This is pure misery. I feel like I've been run over by a steamroller and then thrown in a swimming pool. 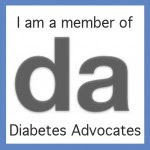 I think about all those people with Type 1 Diabetes before insulin was discovered and became accessible. They died. Period. There was no alternative. And what a miserable way to go it must have been. I can't even imagine. But I know that without insulin, I would meet the same fate. Gone, in likely a matter of months. But insulin is a double edged sword. Yes, it keeps me alive. But accidentally getting too much insulin could also kill me. A low number in the middle of the night strikes terror into my heart. Down to the very depths of my soul. Like Kerri said, sometimes it does feel like I've dodged a bullet. Nightime lows have killed people. And this will continue to happen, until there is a cure. An actual cure. As much as I love insulin and am so grateful to have it, it is not a cure. Not even close. And so I live my life with this double edged sword. All of us with Type 1 do. Aiming for enough insulin, but not too much. It's a delicate dance. I often have the same thought - Looking at the box in the fridge and thinking, "Gee, I'd be dead now if there wasn't that box in my fridge." I have as really long family history of T1 (I'm number 9 on my mom's side of the family), and that's only the ones we know about that were actually treated with insulin... I often wonder how many of my relatives died from D-related complications because insulin just simply didn't exist. It's wild to think about. It's a fine line we walk for sure. Sorry for that High, even though it was several days ago... hope it came down smoothly and you didn't go Low. Thanks for this post, Jess, with the reminder about how important yet delicate insulin is for us. Had a quick question for you. I notice you have a vial and syringe in the photo. Do you prefer using that to a pen format. Just interested as it isn't that common these days. Would love to hear your thoughts. I actually use a pump. But when I see a number like that, I correct with a trusty old syringe, and then worry about changing my set or whatever else. When I'm that high, I want to know I'm getting insulin. The most delicate dance of our lives.